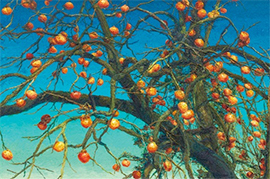 Mizuma Art Gallery is pleased to present OH Chi Gyun’s first solo-exhibition in Japan starting from January 18, 2012. OH was born the youngest of seven children in the rural village of Banseok, Korea, in 1956. He graduated from Seoul National University Art School in 1980 and received a M.F.A. from the Brooklyn College School of Art in 1988 after moving to New York City in 1986. OH has since been exhibiting extensively both in the United States and Korea, this is his first exhibition in Japan. He is now based in Korea. OH Chi Gyun primarily paints landscapes. Sometimes, they are inhabited by a blurry human presence. However, his paintings render Life itself, in its most simple and intricate way. 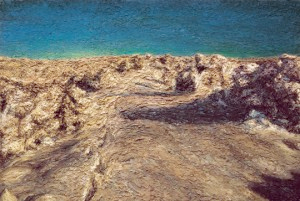 His perfectly mastered impasto technique―using his fingers instead of brushes―coupled with an harmonious gradation of colors bring a non-virtual space to the canvas surface, where layers of light merge with layers of time to guide the viewer into a place irrigated by the continuous flow of memories. Each convoluted stroke appears like a link in an irresistible, almost physical chain reaction of growth and expansion toward the edges of the surface, beyond it, and then back in voluptuous circumvolutions. These currents of vitality englobe the audience in a nearly tangible atmosphere of sensations. The present exhibition includes a selection of OH’s paintings from his days in New York in the 1990s, to his most recent activity in Korea, showing a wide spectrum of his creation. In the paintings from his “New York” and “Santa Fe” series, he gently brushes with the same holistic touch the two extremes of the American territory, expressing the humanity in places where people are usually either negated or absent. Pieces from his “Sabuk” and “Hometown” series, expressing his soothed and tender look on rural Korea as a returnee, set up the atmosphere into which deploys his most recent and acclaimed “Persimmons” series, handing over keys leading deep into the Korean soul. At the crossroads of East and West, light and time, we invite you to discover OH Chi Gyun’s beautiful, yet paradoxical incarnated meditations.